Greylock Lodge, from 1871 to its merger with Lafayette Lodge in 1988. Lafayette Lodge, from 1847 to its merger with Greylock Lodge in 1988. Lafayette-Greylock Lodge, from 1988 to the present. 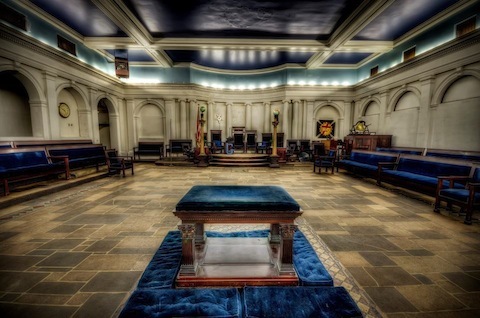 Lodge Hall; picture courtesy of Bro. Frank C. Grace. 12/27/1866: VII-138; Hall dedication reported in the Grand Master's Address at the Feast of St. John. (held 06/20/1866; description). 12/11/1872: 1872-205; Hall dedication reported in the Grand Master's Address at the December Quarterly. (held 10/01/1872). 04/19/1904: 1904-36; Hall dedication, at a Special Communication. 04/05/1929: 1929-66; Hall dedication, at a Special Communication. 04/28/1979: 1979-66; Hall rededication, at a Special Communication. NEW MASONIC TEMPLE FOR NORTH ADAMS, MASS. As the result of a unanimous vote taken jointly recently by members of the five Masonic bodies in North Adams. Mass., the residence at 172 Church Street, built 30 years ago by the late A. C. Houghton, first mayor of North Adams and long a dominant figure in the city's industrial, political and social life, is being purchased for a Masonic temple. Later a corporation may be formed to hold the property for the Masonic orders that are acting jointly in the purchase, Lafayette and Greylock lodges, A. F. and A. M.; Composite Chapter, Royal Arch Masons; Hamilton Council, Royal and Select Masters, and St. Paul Commandery, Knights Templars. In addition to the house itself, a mansion of 17 rooms that has long been regarded as one of the most palatial in the city, the Masonic bodies are acquiring about half the grounds surrounding it. The land included in the transfer has a frontage of 227 feet on Church Street, extending from the Wilkinson property on the north to Pleasant Street, and a frontage on Pleasant street of 230 feet which represents approximately the average depth of the lot that is being taken over, a new line drawn about parallel to Church Street from the present cornerstone of the property on the brow of Pleasant Street, forming a new rear boundary. The Masonic orders, for the past 15 years, have occupied the entire sixth floor of the Kimball building on Main Street where they have a large lodge room, a banquet hall of similar size, a social room and lounges, loeker rooms, reception rooms and kitchen. These rooms will be retained until the new temple is ready for their occupancy at a date which it was impossible today for officers of the organization to state definitely. This page was last modified on 13 October 2015, at 12:09.